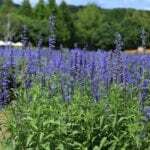 What Type of pH for Salvia? It is potted and in-ground. http://www.armstronggrowers.com/pages/expertise/diseases-pests/armstrong-solutions-syngenta-flowers-salvia will give you guidance. 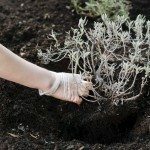 I have grown salvia in both alkaline and acidic soil without problems, however. If it is a hardy variety, it can be planted in the soil (no pot).